A code in the “Code System” can be transformed into a document variable, indicating how often the selected code appears in each document. The document variable is dynamic. MAXQDA will automatically update the document variable, i.e. increasing the variable value if a new segment is coded with the code. This feature is particularly useful as it allows the user to export code frequencies along with variables, or activate documents based on certain code frequencies for analysis. 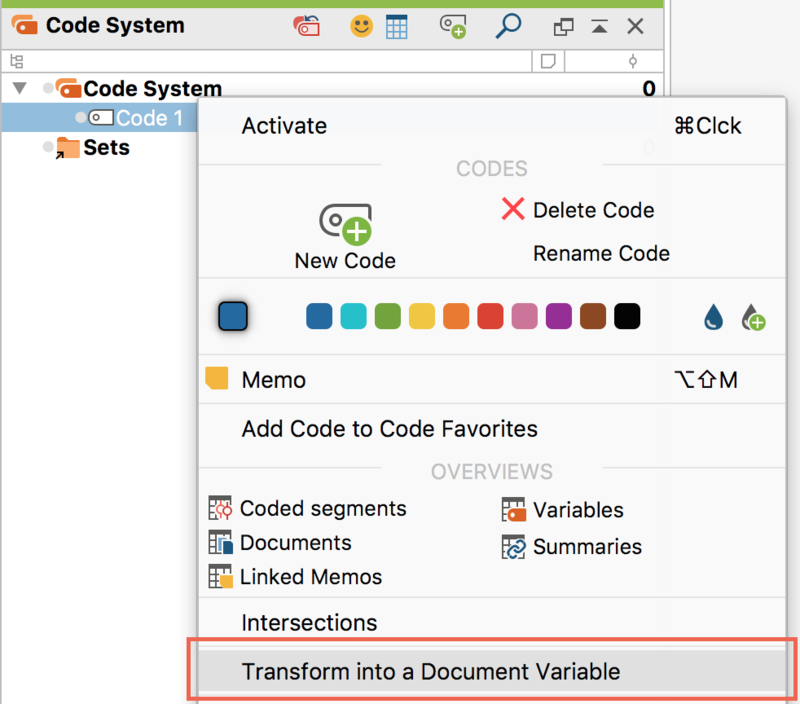 To transform a code into a document variable, right-click the code and select Transform into a Document Variable. MAXQDA will generate a document variable, with the same name as the code, as a numeric variable. The program will automatically insert the code frequency of each document into the appropriate cell of the column. It opens along with the “Data editor” of the document variable and positions it in the appropriate column. Hint: To transform multiple codes into document variables at once, activate all of the codes first, then click the Quantitizing entry in the Mixed Methods menu tab. In the overview of document variables the code could be binarized using the Transform into binary variable button. The variable is thereupon no longer indicated according frequency of an associated code in a given document, but rather whether it occurs in a document (= “1”) or not (= “0”).